Living in the burbs, there are plenty of places to eat. But for whatever reason, I don’t venture out much. I have my favorite haunts and I stick to them. Last week, I took a trip to Plate, in Suburban Square. I’d only been there once before, and that was years ago. But I remember liking my food that time. Complimentary rolls… freakin tasty. 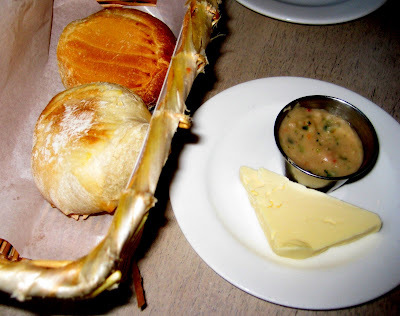 It comes with a hunk of butter and some mysterious dipping concoction. I loved it. We eventually asked what it was, and it turned out to be hummus. But I don’t buy it. I think it was something else. It wasn’t nearly chickpea enough and a bit too smooth, but whatever, it was good. F got this tempura maki roll thing. I couldn’t find it on the menu so I don’t have a spot-on description for it. But it was a maki roll with black rice and other things on the inside and deep fried. We thought it would have something tempura’d on the inside, not be entirely tempura’d. Not bad though. Just strange. 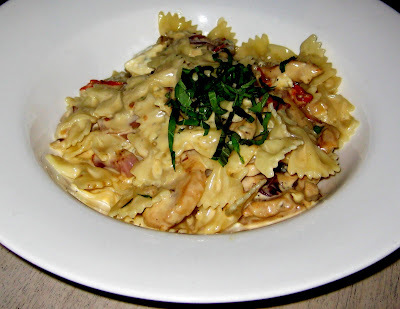 F also got the farfalle with smoked chicken. The waitress warned that this was an extremely smokey dish. That some people couldn’t handle the smokiness of it all. As if describing the dish as smokey couldn’t actually do the justice of how really smoky it really was. Well, in the end, it was quite smokey, but not extraordinarily so. So the chicken tasted a bit like ham, is that bad? Not if you like ham! 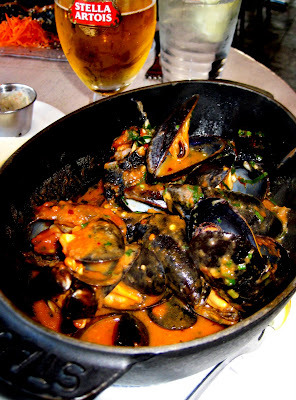 I got some mussels as an appetizer. These came in a roasted garlic and spicy tomato sauce. The mussels themselves were teeny tiny, but the sauce was good. I wasn’t all that hungry, so I also got a little side of mac and cheese. This mac and cheese was friggin good! 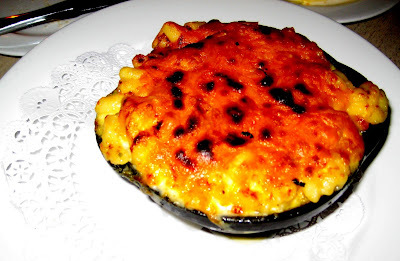 The melted and charred cheddar on top I could have done away with, but otherwise, a very fine mac and cheese. The service was good, our waitress was cute as a button and very helpful. They also did not rush us at all and let us stay as long as we wanted to. We ended up pretty much closing up the place. All in all, a nice suburban dining experience.